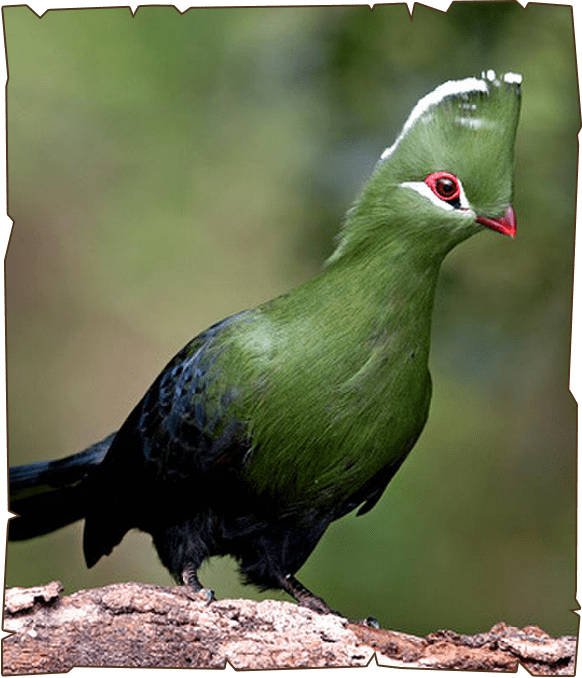 In southern Africa, both Turacos and go-away-birds are commonly known as louries. They are semi-zygodactylous – the fourth (outer) toe can be switched back and forth. The second and third toes, which always points forward are conjoined in some species. Musophagids often have prominent crests and long tails; the turacos are noted for peculiar and unique pigments giving them their bright green and red feathers. It is a resident breeder in the forests of tropical West Africa. It lays two eggs in a tree platform nest. These birds, often inconspicuous in the treetops are 43 cm long, including a long tail.